1st Class Transportation offers highly affordable rates for a Quinceanera limo service. Your daughter’s special day should be remembered for years to come. Her turning 15 is a special occasion that only happens once in a lifetime, that’s why 1st Class Transportation is here to make sure the experience is even better. Our limos are great for a Quinceanera, or if their are more people than what our regular limos hold, an affordable party bus is also a great option. 1st Class Transportation takes the time to understand each and every customers specific needs. Every customer is different, and we have years of experience in providing 5 star rated customer service. Bilingual Chauffeurs: We employ Spanish speaking chauffeurs, so you can make sure that your requests are understood in Spanish. 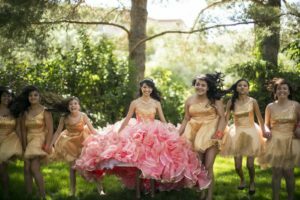 Affordability: Our Quinceanera limo packages are some of the lowest in the Minnesota area that we have seen. We consistently monitor competitors prices to make sure we are always on the competitive edge. Professionalism: 1st Class Transportation understands that high customer satisfaction is what makes us preferred over other companies. We take pride in satisfying our customers requests to ensure they have a great occasion. 1st Class Fleet: We provide only the highest quality vehicles on the market with the best safety features and highly customized interior. If you need a spacious SUV rental or a limo rental, 1st Class Transportation has you covered. How much does a limo or party bus cost? That depends completely on the area of the event, the amount of time that you need to rent the vehicle for and what vehicle you rent, be it a limo rental or a party bus rental. We also offer free quotes to ensure that you know the exact price point. Without hidden fees, before you book your Quinceanera. Click book now below to schedule your limo or party bus for a Quinceañera.